In the 1730’s, John Wesley, his brother Charles and a few friends began a meeting of prayer and Christian accountability at Oxford University. Branded the Holy Club by critics, they began a lifestyle of worship, ministry to the marginalized and revival among the current church system in England. Their ministry spread to the colonies in North America and turned into a separate church in the United States. The original values of the Methodist movement were focused on being transformed in the image of Christ through the pursuit of holy living and the theological idea of being the children of a loving God. They accomplished this by careful design and method...hence the name Methodist. After various divisions and reconciliations, The United Methodist Church was created in 1968 when Bishop Reuben H. Mueller, representing The Evangelical United Brethren Church, and Bishop Lloyd C. Wicke of The Methodist Church joined hands at the constituting General Conference in Dallas, Texas. With the words, "Lord of the Church, we are united in Thee, in Thy Church and now in The United Methodist Church," the new denomination was given birth by two churches that had distinguished histories and influential ministries in various parts of the world. 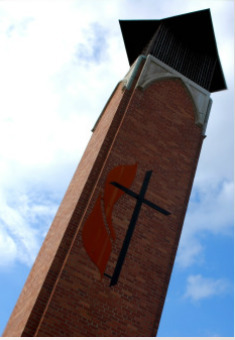 If you would like to know more about our history, please visit http://www.umc.org/who-we-are/history. United Methodists share a common heritage with all Christians. When we say the Apostles' Creed, we join with millions of Christians through the ages in an understanding of God as a Trinity—three persons in one: Father, Son, and Holy Spirit. From early in our Judaic roots we've affirmed that God is one and indivisible, yet God is revealed in three distinct ways. "God in three persons, blessed Trinity" is one way of speaking about the several ways we experience God. To learn more about what United Methodists believe, please visit http://www.umc.org/what-we-believe/basics-of-our-faith.